The Vibe Slick 2000 Watt System Wiring Kit is specifically designed to gain maximum output from high power full range systems. 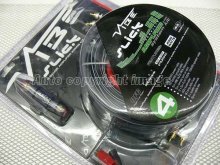 Combining the best full range cables from the VIBE CriticalLink TM range. 5m VIBE SLICK RCA Interconnect. 5m Remote Turn On Wire. 2 x 5m FLAT16SPK 16AWG Speaker Cable.